When someone comes up to you and says, “You should come to lunch with me today and grab some amazing gourmet chicken tacos,” then half-way there they point out a food cart, most times you might think that you are in for an afternoon in the office bathroom. Not if you are being led to the Gastro Cart on 18th and Curtis (right in front of the Ritz). This may be the best street food in Denver, with its only real challenger being the best sausages in Denver – Biker Jims (this review is pending). On the advice of a blurb in 5280, I made my way down to the Gastro Cart a couple of weeks ago. This is the single best lunch decision I have ever made. I had a chicken slider with Frank’s gravy on a buttered brioche bun, and a phenomenal spicy chicken taco. This all came with a bit of quinoa and bread-and-butter pickles. It is tastily clear that the chef’s, Mike Winston and Bryan Hume, love their food. The flavors in these two simply prepared items were transcendent. The next week I went back for another slider and the veg taco. Even better the second time around. Later that week I went back for the potsticker and another chicken taco. After visiting three times in two weeks, you might think I need a break this upcoming week. Not so. My mouth is watering as I type this. I want to try the gyros. I want to try the next interesting special they come up with. I just want to hang out at the cart and watch them cook. If you like good food, I mean REALLY good food, make a lunchtime trip down to the Gastro Cart, you will not be sorry! Several years ago I decided to take my homecoming date to Rodizio Grill, a new place where they served interesting meats and had an enormous salad bar. I enjoyed it. I was too young to know better. There is now only one Rodizio in the greater Denver metropolitan area. There is a reason for this. It was with great reluctance that I decided to head back to a Brazilian steakhouse; Texas de Brazil in Stapleton Northfield. Suzy and I have now been there three times in the past year, or so. It is that good. The interior of the restaurant is modern, dark, and red all at the same time. It is very open, yet seems to feel cozy at the same time. As soon as you are seated you are given the instructions; go get some salad at the eclectic salad bar, come back and eat, then turn your start/stop chip to green, get ready to eat a lot of great meat. The salad bar might be worth the trip alone. It is full of great veggies, tasty cheeses, and other appetizers (I absolutely love the grapes in blue cheese dressing!). But once you are ready for a trip to meat heaven and you turn your chip to green, you quickly forget about the salad bar. You are inundated with meats from traditionally-dressed gauchos bearing traditionally-cooked Brazilian meats – meaning, cooked medium and with a good amount of salt. Some highlights: the bacon-wrapped filet, the bacon-wrapped chicken, the sausage, and the prime rib. There are other great offerings, but these are the items that might make you get more than one. When you need a break, and you will, flip your chip to red (although the sometimes over-anxious gauchos will still stop by). Once you are done with your feast, it is time for desert. I am not listing them here, but trust me when I tell you they are all fantastic. Texas de Brazil is a winner. The meat is cooked perfectly. The salad bar is interesting and tasty. And you can get by with only eating dinner for a day – in fact, I would suggest not eating all day to prepare for the onslaught of food you are about to intake. My suggestion: GO TO TdB!!!! It has been a while since I have added a post to this blog. Laziness reared her ugly head for a bit, but I am back. I recently asked myself if I even really want to have a food blog – there are thousands already out there. Then I watched an episode of No Reservations (a great show, by the way) where Tony spoke with a couple of hard-core food bloggers. They had lost the love of just going to a restaurant and eating to eat. I don’t want to lose that love, but this isn’t a hard-core food blog. It is fun. It is about good food. It is sometimes about terrible food that is great. It might even be about great food that is terrible. Either way, I just want to tell as many people about eating non-pretentiously in the Denver area. On a recent Saturday visit way up north of Denver to the Orchard Town Center in Westminster, just off of 144th and I-25, we decided to grab a couple of crepes for lunch. We didn’t have much time, as the reason for our visit was a 12:30 showing of Avatar (by the way, go see this movie in IMAX 3-D…the movie itself is terrible, but the CGI and 3-D is worth seeing) and we got there just a bit before noon. We hustled over to Crepes de Paris, and lucky for us there was no line. Actually, there was no one in the place except for the impatient counter girl. I am going to point out a couple of things from what you just read: it was Saturday, and it was just before noon. This place should have had at least a few people dining on crepes, or sandwiches, or a refreshing Orangina. But, alas, the establishment was empty. This was the first sign. We then perused the large menu and decided on what we thought would be a couple of quick crepes; a ham and cheese and a Nutella. The counter girl asked if we wanted to eat there, or take them to go. Suzy asked how they are served to go, hoping that they were wrapped in paper just like every crepe we had in Paris. We were told they were put on a plate with a plastic top. Sign two. We paid and sat in one of the very empty seats. Several minutes went by before we got up to watch the expert French creper (or whatever you would call a crepe master) make these painfully easy snacks. It was an older gentlemen who looked like he had never made one of these delightful morsels before. Sign three. He had just barely started the ham and cheese after almost finishing the Nutella. Sign four. He then finished both of them, a chocolate drizzle on the nutella and extra ham on the ham and cheese, then put on the plastic tops. We were free to eat and run to the theatre after almost 13 minutes in the shop. 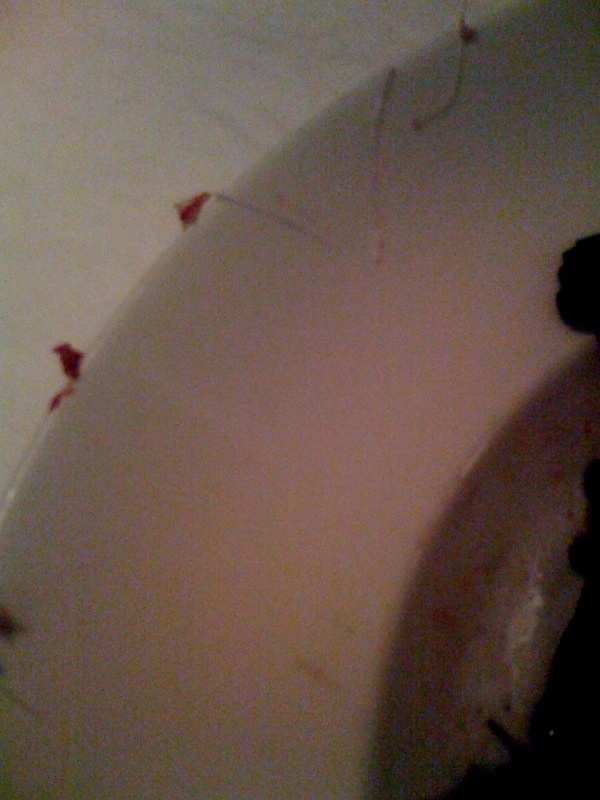 On to the food…I don’t want to exaggerate here, but these were the WORST CREPES EVER MADE! They were thick, chewy, flavorless. And there was so much Nutella in mine that my tongue stuck to the roof of my mouth. These were awful. Criminally awful. I almost wanted to call the French authorities. But we were running late, and we needed to get our 3-D glasses. So, we trashed the remaining 85% of our crepes and made a dash for the snack bar at the cimemaplex. The popcorn was fairly decent. I cannot say this enough, do not go to Crepes de Paris. It will be the worst thing you ever do (for that day). ‘Twas New Years Eve and we didn’t want to be complete homebodies, so Suzy and I made reservations to our go to restaurant in Denver, Le Central (“the affordable French restaurant”). We have been here countless times for dinner and have loved every bite taken. The moules frites (mussels and fries) are fantastic and make either a great app to split, or a great dinner for one. I am always impressed at the service, as well. Not only are the servers (typically) French, but they seem to be pretty friendly as well. Each time we come here it is like stepping back into a small French countryside restaurant. For New Years Eve, as well as many other special days throughout the year, Le Central had a prix fixe that allowed us to choose one appetizer each, one main course each, and then everyone got the same dessert. Suzy had the lobster and brandy soup and I had the French onion soup. The lobster soup had a spicy boursin quenelle perched on top, and added to a fantastic start to the meal. The soup was creamy, and had a wonderful lobster flavor. The French onion soup was topped with swiss and gruyere cheese, and was incredibly rich. The broth was very beefy, and reminded me of a wonderful beef sauce I had eagerly consumed during a previous visit. Suzy then dined on sea bass and blue prawn, while I had the beef tenderloin. Once again Suzy loved her dish. Alongside the bass was a creamy risotto that she savored as long as possible. The bass was perfectly cooked, and the prawn was delicious. Unfortunately, my beef was not as good. I am assuming that in the cooking of so many beef dishes on this busy night they just slipped up, but it was dry and not too flavorful. Luckily it was topped with a nice piece of seared fois gras and black truffle slices that really helped the flavor. We then were treated to a very blah dessert of chocolate cake, a cream filled profiterole, and a vanilla and strawberry creme anglaise. Overall, a nice dinner, but I am glad that the quality is usually better on a normal night. One issue I had all night was the service. Like I said above, we normally have GREAT service. New Years Eve was a different story. Our server was lazy, quiet, and inattentive. Kind of a bummer for such a festive night. Oh well. I strongly suggest visiting Le Central! I strongly suggest the moules frites! I strongly suggest going on a night that will not have a menu prix fixe! On Saturday, Suzy and I joined my mom and sister at my favorite fish house in the Denver area – Jax. We have loved this place for quite some time, but hadn’t been to the Denver location (there is another one in Boulder whose head chef won the Top Chef honor on the reality show). A few things have changed since we last dined here; the calamari is now the typical ring shape rather than the atypical filet, they seemed to have crammed in a few more tables, and they did not seem as busy. These are not necessarily bad changes. The calamari is still my favorite in town, and is to die for. It is perfectly fried with a crispy, but light, coating. It is tender, not chewy like most chain restaurants. And it has the best sweet chili sauce possible for the squid – not overpowering, but definitely present. The extra tables probably are needed during busy times. And the fact that it wasn’t busy when we were there is not that strange since it was just the day after Christmas. I have already described the calamari, but we also had raw oysters to start. This place is known for its oysters, and these did not disappoint. They tasted as though we picked them up straight from the ocean (which would have been difficult since 1/2 of them came from the west coast, and the other 1/2 came from the east coast). We took the advice of our waiter on these, as I know very little about these things except that they taste great! For dinner I had the grilled steelhead steak with lentils and a huckleberry chutney, my wife had the blackened catfish with pickled shrimp-cornbread pudding, and my sister and mom both got the pan seared sea scallops with goat cheese celeriac puree. Unfortunately my steelhead steak, which tasted just like a mild salmon, was filled with pin bones and rib bones (check out the picture). This is one of my pet peeves regarding fish. TAKE OUT THE BONES!!! The meat on the fish itself was perfectly medium well cooked, and melted in my mouth (when I didn’t have to pick out a pin bone). The lentils were meh, but I ordered this entree for the fish, not the lentils (not a huge fan of ’em). Suzy loved the blackened catfish. 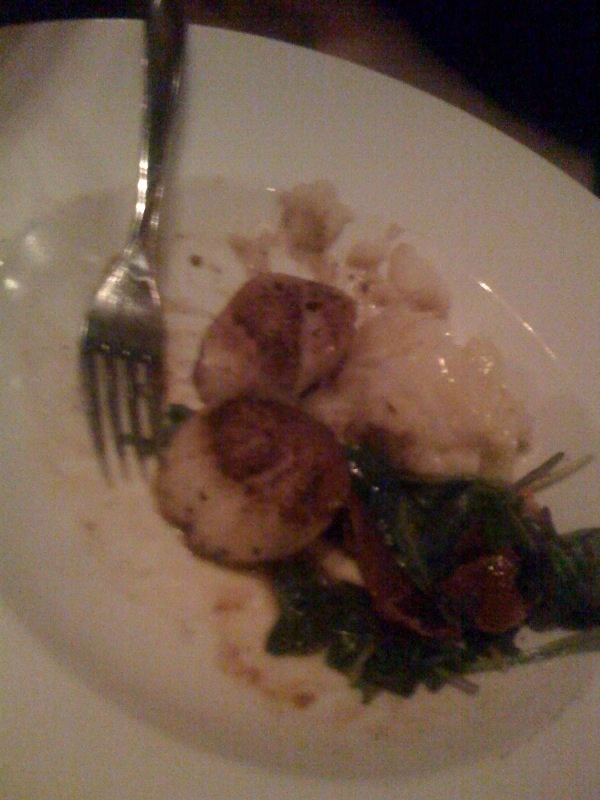 The scallops were also perfectly cooked, and tasted fantastic (my sister was gracious enough to give me a bite). They were not chewy, but had enough texture to make them pleasant to my mouth. After all that food we didn’t have any room for desert, so we just asked for the check. This is when I became impressed with the service. I didn’t think our waiter had noticed the bones, even after we said something as the table was being bussed; however, when he came back with the bill, he told me he took 50% off my dinner since there were so many bones. Very classy! Overall, another great visit to Jax! Go there!! Well, I have some good news, and I have some bad news. First the good news – the McRib is back for a limited time in Denver. It is available at just about every McDonald’s in the metro area for a limited time, so go get yours before they disappear. If you have never had the opportunity, or the desire, to experience the McRib, you have missed out. The sandwich with a cult-like following contains a pressed “pork” patty in the shape of a small rack of ribs. It is thoroughly soaked in a sweet barbeque sauce, then topped with a bit more upon being placed on the bottom piece of bread. The patty is topped with white onions and a few dill pickle slices, then topped with the bread. It might remind you of the mystery meat you were served in elementary or middle school, but in the best way possible. Don’t miss out, head over to your local golden arches and eat up! Now the bad news – the McRib is back for a limited time in Denver. While the sandwich described above is required eating when available, the fact that it is only around for a limited time means that eating it a couple of times a week is not out of the question. There are two problems with this: a) this sandwich cannot be good for you, and b) eating just about anything from Mickey D’s, and especially the McRib, will result in several trips to the commode. My suggestion is to enjoy the McRib, but stop at a bookstore on your way to see Mayor McCheese and Grimace. This will give you a new book or magazine to read while in the WC, and take your mind off of the certain discomfort you are experiencing. So, go get your McRib (and if you large size the meal, a spiffy Coke glass), a book, and plenty of TP, then experience a true holiday tradition!